America's Declaration of Independence is one of the most important statements on human freedom ever published. We laud Thomas Jefferson for penning the document's flowing prose, but most of its lofty themes did not spring anew from his mind. Instead, he relied on the powerful concepts evoked by the Enlightenment, ancient Greek and Latin writings, and what he termed the "harmonizing sentiments of the day." There is much less harmonizing in twenty-first century America. Although united in name, divisions abound, in part because we have forgotten the core messages written in our nation's birth certificate. Self-Evident returns the discussion to the foundational rights and Enlightenment beliefs of mankind's place in history. 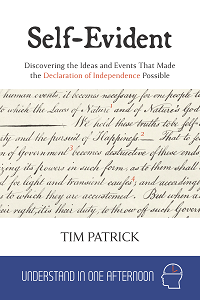 It does this by examining the primary sources and key events that united a nation. In a world with instant access to endless entertainments and divisive arguments, Self-Evident will guide you back to the ideas that extended liberty across the globe. In a world awash in nearly unlimited information, the Understand in One Afternoon series helps you discover the essentials of important subjects in a reasonable amount of time. Each book is designed to be consumed in about four hours—in one afternoon—and offers a core grounding in topics ranging from current events to technology, from philosophy to business. Self-Evident is now available for purchase in paperback and ebook formats. Buy the paperback book from Amazon or Barnes & Noble. Buy the ebook edition from Amazon Kindle.